When the secret Krabby Patty formula is stolen, there's a complete breakdown of social order. 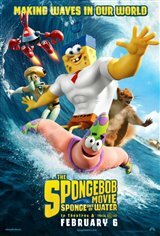 SpongeBob SquarePants and his friends come ashore to our world to find the culprit. When they discover the formula was stolen by supervillain Burger-Beard (Antonio Banderas), they have to become superheroes in order to serve justice.